I am too old for this CRAP. Last Sunday, my nephew was playing in a softball tournament, slid into third base "leg first" snapped 2 bones in his leg, surgery on Thursday. Tonight about 5:30 or so get a call from my daughter saying, some lady ran a stop sign and I got hit BAD, she was crying. Ambulance took her to the ER. In the hospital, Daughter told me she pushed the brakes as hard as she could but could not stop in time. Just got home from the hospital. THANKFULLY no broken bones, sore lower back and both knee's hurt as they slammed into the dash board. I'm sure she'll be awful sore tomorrow. Moms spending the night with her. The other driver admitted she ran the stop sign to the police "I know the cop", refused medical treatment and had a child in a car seat. THANKFULLY neither were hurt, although the driver had a big knot on the side of her head. She loved her little car, nic named him "stash" short for pistachio. Thank God she seems to be ok for now!!! I saw the thread title and was going to make a bit of an old age joke of it, but it doesn’t feel right. May want to get the old ticker checked my friend. I am only 18 months into my journey here and I have learned the core principles of what children are really here for. Their smile will warn your heard like no other, and those first “morning hugs” he gives are each priceless., the second thing they are for is inducing heart attacks.... I have bruises from diving across things to catch him before he falls off of something I never saw him climb up on in the first place. Rough times; you (and your family) have my sympathy & my empathy, sir. Sorry about your Nephew's leg. I haven't heard of a person sliding to a base braking a leg and in his case even worse with 2 bones breaking. OUCH! But it probably happens a lot, and I just haven't heard about it. Your Daughter and the other girl and child are lucky it wasn't worse! I hope they all heal quickly with as little pain as possible. I agree with when it rains, it pours. Also, bad things come in threes. So watch out! Bad, but way better than what it could have been. Here's hoping she heals well. Interesting to see that amount of damage on the Hyundai and see that the airbag doesdn't appear to have deployed. Hope your daughter and nephew both make a speedy recovery. Keep us updated. You don't have to be too old to be too old for that little stretch of bad luck. I hope everyone heals quickly and you're all able to put it behind you and move forward. Sorry it happened, but I'm glad everyone is going to be ok. Correct and in some cars you really must crunch it head in for them to deploy. My sons Toyota Celica T-boned a car that ran a stop sign hard enough the drivers door was almost in the middle of the car. His airbags never deployed his motor was into the firewall. Other cars seem to bump a parking meter and boom new bag. Thankfully it all worked out Dave. What a string of luck right? Toyota has had issues with airbags not deploying when they should. There have been a few recalls for it. Daggone oldrocker....sorry to hear. Glad everyone will be ok. Thanks for the supportive comments. She is quite sore but doing fine, no headaches, blurry vision so far. Got a follow up with primary care doctor tomorrow. Poor kid, stopped by last night to see if she needed anything and she ask if I could water her flowers. As I was getting the hose, I hear her say "dammit" rather loud. Apparently, one of her elderly neighbors feeds some wild cats and one of them used her flower bed as a litter box again!!! FYI, she's quite the cat lover but not in this situation. Airbags did not deploy. 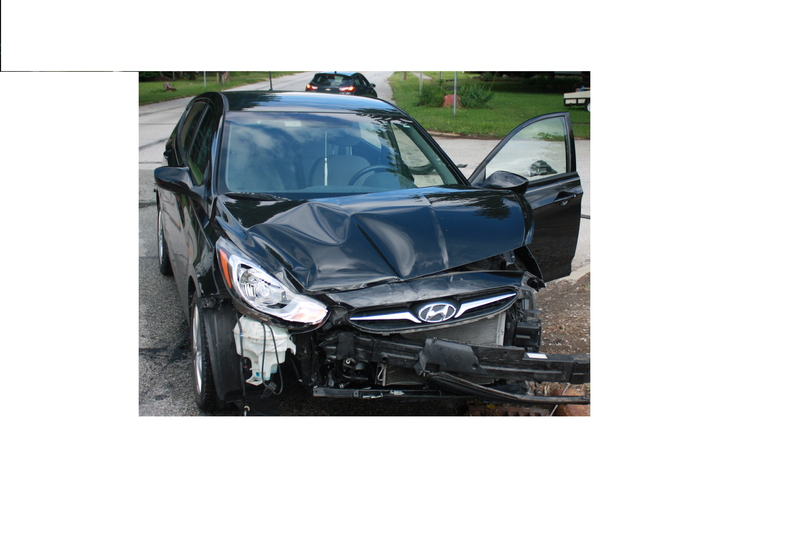 She was driving a 2012 Hyundai Accent, other vehicle was a 2015 Hyundai Tuscan. She was going not quite 30mph through a small town when it happened. I think the bag not deploying was a good thing as the kid sits so close to the steering wheel. Now starts all the paperwork from the whole incident. As far as my nephew, he broke his right leg tibia and fibula, I have a pic of the xray on my phone but it would load here which is good, it's a nasty looking break. He's having surgery today at noon in Indy to put 2 plates in his leg. I told my wife once everything is back to normal, I'm going shopping, Audio shopping!!!! Shopping for audio stuff has ALWAYS worked for me to relieve stress tension for a while. That's too much at one time, even for youngsters. Forget the old comment. Sorry to hear about this. Same thing happened to my daughter earlier this year. Lady in a truck ran a red light and T-boned her on passenger side where her son was buckled in, in the back seat. Lady fully admitted she was on the phone and it was her fault. Still, doesn't make the pain and hassle in getting a replacement car any easier. Not something anyone plans for. Hope surgery goes well and he can return to full and active life. My lol to the original post was for this comment only. I am glad all is looking up and things are getting better. Yikes! I’ll be keeping your family in my prayers. Well, the car is officially totaled. Front piece of the frame was bent 90 degrees and snapped. THANKFULLY, daughter appears to be on the mend but has an issue that has manifested that is being evaluated. Thanks for the update. We're all keeping our fingers crossed for her full recovery. Stay strong and don't forget to take care of yourself during this stressful time. I just saw this thread, and I'm very sorry to hear about both the traumas you and your family have recently experienced. Children and grandchildren are the source of the greatest pleasure we have in life. The reciprocal of that is that because we care for them so much, their pain affects us deeply. Prayers and best wishes to you and them. I hope they recover speedily. Thanks all for the encouraging words. I believe she will heal up, just take some time. She's getting her sense of humor back as I ask her if we needed to play "taps" as her old car heads off to the salvage place. Nooshinjohn, if you think your children bring such joy, wait until you get grandkids, and the best part you get to send them home after all the good stuff is over. Daughter is slowly getting back to normal. got her another car last week and she is back working under restrictions. She is doing physical therapy for her L4 & L5 disc problem as a starting point to recovery. Hopefully PT will work and she will not need any surgery down the road to fix things. Having never been through a situation like this, it has been an eye opening experience. Good news....prayers for a speedy recovery and things get back to normal.